The Foca Sport II was an improvement of the previous Foca Sport French popular camera with a rangefinder. Made from 1961 to 1962, the Foca Sport II kept some of the improvments of previous models, including the film advance lever. The lens, a 45 mm f/2.8 Oplar Color, was better and faster. The advanced viewfinder and the lightmeter of previous models disappeared but a rangefinder was added. It was one of the most interesting models of this camera. Later evolutions were rather regressions. 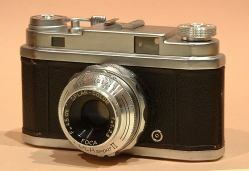 Though it kept most of the original camera's features, post-1962 Foca Sport were made of plastic and looked quite ugly.